Easy to install at three different heights. 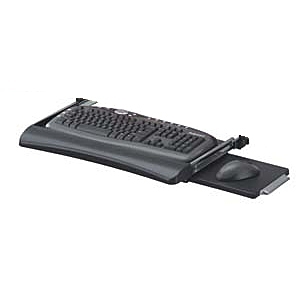 Features a retractable mouse station that can be installed for both left and right hand use. The underdesk keyboard tray is designed for smooth and silent gliding and is perfect for converting conventional desks to a more convenient workstation. Our brands are synonymous with quality and innovation because our product development is fueled by fact-based research and consumer insights. Our innovative solutions help people order their lives - at work, at home and on the go. Features a keyboard stopper to keep keyboard securely on tray. I have used this unit daily for 3 weeks and it works well. It's well built, assembled and installed easily, and has an adequate keyboard positioning lock. For the price, it's a steal!